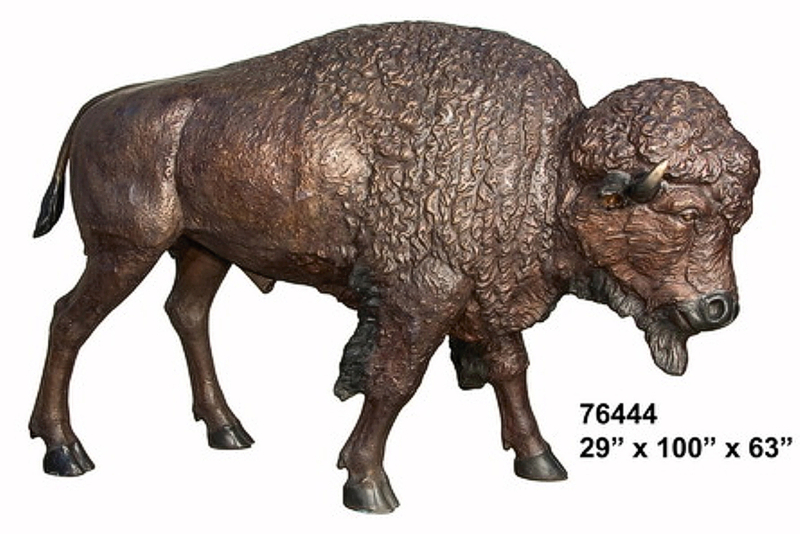 Bronze Bisons. A great school mascot. Add this piece to your zoo, wildlife park resort, ranch, storefront or restaurant and watch the crowds’ line up for a photo op. With the westward movement of white civilization in the 18th and 19th centuries, the bison were slaughtered in masses. They were hunted for the commercial sale of their meat and hides, or simply for sport. By the early 19th century the bison had been exterminated east of the Mississippi River. The extension of railroads across the Great Plains in the 1860s led to the decimation of the vast herds that foraged on the open grasslands. One notorious hunter, Buffalo Bill Cody killed over 4000 bison in 2 years while supplying meat for railroad workers. The white man’s slaughter of the bison also had a conscious political objective that was to deprive the Indians of their means of subsistence, and making it easier to drive them on to reservations or make them adopt settled agricultural pursuits. A major portion of the hostility between the Indians and the whites was caused by the whites’ never-ending destruction of the bison population. By 1870 the bison herds on the Great Plains had been divided into two parts, lying north and south, respectively, of the Union Pacific railway line. The southern population was wiped out by 1875 and the northern one by 1885. Incredibly, by 1889, there was fewer than 1,000 bison in all of North America.